Any further enquiries please contact GHCticketing@gmail.com for the waiting list / to see if any final seats on your teams table are available. Sorry for any disapointment this may cause. 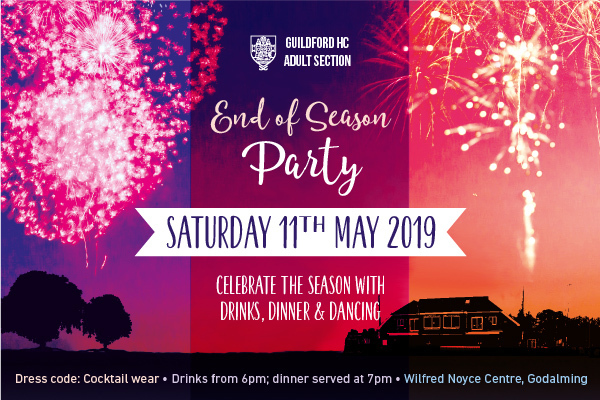 All GHC Adult Hockey players and their partners* (or Parents)* are welcome to an evening of celebration at the Wilfrid Noyce Centre Godalming on Saturday 11th of May (The 24th of May is an incorrect date). The evening begins with an opportunity to mingle and purchase raffle tickets. During the main course there will BRIEFLY be awards for the Players of the Season and Most improved of each team. After this The Katalinas will help us party and dance the night away. Arrival from 6pm, dinner served at 7pm, carriages 11:30-Midnight. Entry to the event and all that it brings with it. Starter - Locally smoked Scottish salmon with leaves, capers and a yuzu dressing. Served with rustic bread. Vegetarian / alternatives available, please select via Dietary requirements on checkout and I will be in contact. Tickets are non-refundable in the first instance, however please contact GHCTicketing to see if it is at least possible to refund part of the ticket. If you wish to transfer your ticket to someone else, consider any dietary requirements, seating requests that may need to be changed. Please let GHCTicketing@gmail.com know of the transfer. Note: U18s who play Adult Hockey can attend with or without their Parents. Should they attend without their parents their captain will do their best to be their responsible adult, however ultimately it is the players responsibility to behave and adhere to the expectations set by their parents. *Partners and Parents are asked to wait until the later ticket types to ensure all Players are given a sizable opportunity to attend. Should you particularly wish to purchase an earlier ticket type, please contact GHCTicketing@gmail.com with your request. Limited availability! Get in early for the subsidised ticket. Available until the 17th February 23:59. Specifically reserved for Players. Oh no! just missed out on the Early Bird Ticket, but there is still a discount! Available until the 7th of April 23:59 or until ticket sell out. For Players, Partners and Parents. Standard Ticket. Available until the 21st of April or until tickets sell out. For Players, Partners and Parents. Support your club by spending extra money now on your ticket! More opportunities to support your club will be available on the night. For Players, Partners and Parents.